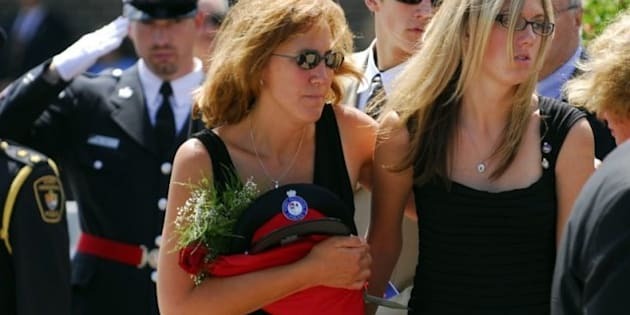 CBC — The wife of an Ontario police officer who died in 2007 in the line of duty is extending her condolences to the family of Const. Garrett Styles, the York Region officer who lost his life after being dragged by a car allegedly driven by an unlicensed 15-year-old. Sonja Plunkett spoke to reporters briefly Wednesday after the sentencing of Nadeem Jiwa, who was convicted of manslaughter in the death of her husband, York police Det.-Const. Robert Plunkett. Jiwa, 23, was sentenced to 12 years in prison but was given two-for-one credit of seven years and two months for time spent in pre-trial detention, which means he only has to serve another four years and two months behind bars. "Our family has been taken on a very long and unimaginable journey, one that no family, let alone a police family, should ever have to endure,” Plunkett said. "My attention is now turning towards the Styles family and all members of the York Regional Police at this most difficult time. My family extends their deepest condolences. Another journey has just begun." Styles died the day before Jiwa's sentencing after he stopped a car on a rural highway east of Newmarket, Ont. He is survived by his wife, Melissa, a civilian employee of the York Regional Police Service, and two young children — Meredith, 2½, and nine-week-old Nolan. A funeral for Styles will be held Tuesday in Newmarket. Some 6,000 officers from across North America are expected to attend. Styles's wife and children will also be there, although it is not known if she will address those in attendance. She has not spoken publicly about her husband's death. Police "do an honourable, difficult and selfless job," Plunkett said Wednesday. "That is what my husband, Robert Plunkett, was all about." Robert was trying to arrest Jiwa on a residential street in Markham on Aug. 2, 2007, during an investigation into airbag thefts. Jiwa reversed the car and pinned Plunkett between a tree and the car's open door. Plunkett died later in hospital. “The police deserve our respect," Sonja Plunkett said. "When asked to stop, you have to stop. Had [Jiwa] just listened and shown just a touch of respect, my husband and the father of my three children would still be here today." The 22-year veteran of the force and a father of three died in hospital of his injuries. He won awards for his bravery on the job, and was once named "toughest cop alive" at the Canadian Law Enforcement Games for his strength and athleticism. The teen who allegedly drove the minivan that Styles stopped just before he died has been charged with first degree murder. Styles was dragged by a minivan for 300 metres before the vehicle flipped, pinning him underneath. Styles died in hospital of his injuries. The teen suffered massive head injuries when the van rolled over and doctors fear he could be paralyzed. He is to appear in court on July 7, two days after Styles' funeral. Styles, who died five days before his 33rd birthday, joined the York police force seven years ago and was on his way to becoming a sergeant.